Green oak, landscape grade, approx 2.4m(8ft) long. A “green” oak sleeper of landscaping grade. 2.4m(8ft) long, 200mm(8in) x 100mm(4in) approx. 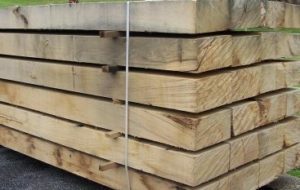 These new (green oak) oak sleepers are freshly cut and will change colour from golden yellow through to silver over a time period of 12 months. As they are hardwood they are untreated so will not leach any chemicals into the surrounding environment. As they age they will split and crack as the timber dries out. These sleepers are heavy – weighing circa 70 kgs. They require two people to man handle them. Can be fitted together using traditional wooden pegs in drilled holes. Alternatively can be fitted with coach screws or landscape screws although a pilot hole will be required. Ideal for use creating raised beds, decking, steps, bridges over water features, garden furniture, lintels and retaining walls amongst other landscaping features. These oak sleepers are very hard to cut. You will need a powerful circular saw or chainsaw to cut. Assume you blades will blunt very quickly. Alternatively you can use a traditional bow saw but allow plenty of time and energy to cut. These new oak railway sleepers are a natural product – they will have cracks, shakes, splits and knots. Although we endeavour to provide a standard product, you will find some have scalloped edges and that the measurements are approximate only. 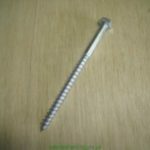 Performance structural timber screw designed for use with sleepers, decking, fencing and roofing. BZP (bright zinc plated) for long life. 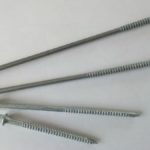 we offer the coach screws in various lengths.